Menu: Z to start game. Game: Left/right arrows to move fan. Z to blow puffs of air, X to add more seeds (falling from above). Dandelion seeds are falling and you can decide how you want them to land! Blow them directly up by sending puffs of air from right below them, or move them left and right by blowing air past one side! When they land they will turn into lovely dandelions. You start with 5 seeds and you can add more any time by pressing X.
I've worked on no fewer than 4 projects this month, I think. But I'm really happy I got this one done in the end - it was a bit last minute as many months go, but it feels so pure and nice to play with the dandelion seeds and get your little garden _just so_. I also decided quite late on that it would be a #nogameovers game - what would be the point of a game over? 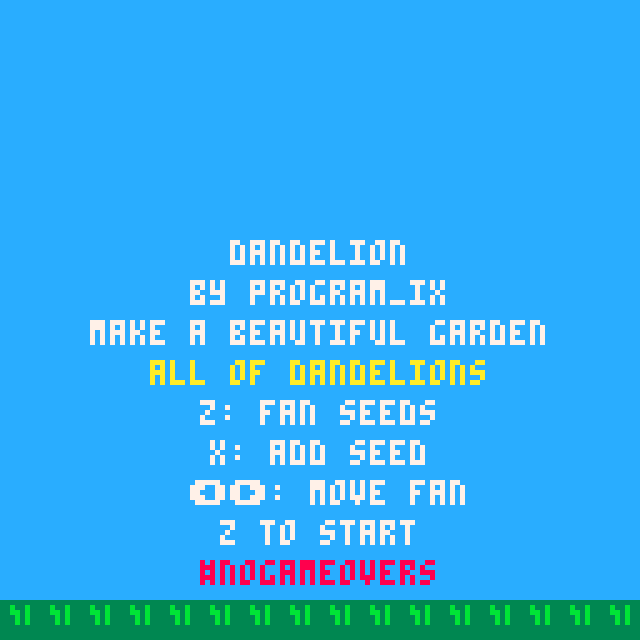 At first it was going to be that the first dandelion seed landing would freeze the game, play the growth animation and then take you to a game over screen, but this version is way more fun. The game should work great in the browser whether downloaded or not! Download the ZIP and put both files in the same folder, then double-click on 'dandelion.html'. It should open like a normal webpage. The binaries just need to be downloaded and unzipped on the correct kind of computer - they should work from the unzipped folder with no extra messing. I'm just using the built-in PICO-8 binary export, but please let me know if something is weird with them. It is a new enough feature. If you have PICO-8 and want to check out the game's code/etc. 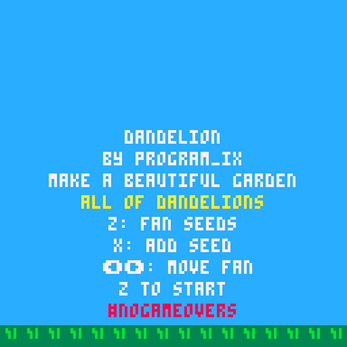 or just play it in the 'real thing', download either dandelion.p8 or dandelion.p8.png to your pico-8/carts directory, then load from within the game with 'load dandelion'.